Sea Cloud Cruises, the specialist in boutique yachting, has once again been recognised by the annual Berlitz Cruising & Cruise Ships 2014 guide. 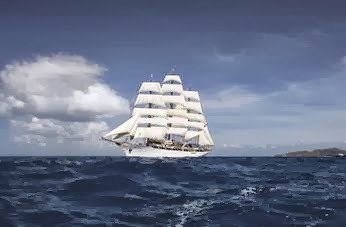 Both its windjammer yachts – Sea Cloud and sister ship Sea Cloud II – were ranked in the top 5 boutique ships (50 to 250 guests). The respected guide is now in its 29th year of publication and features in-depth reviews of 285 ships, highlighting each ship's strengths and weaknesses and offering advice on finding the best facilities, food and service to suit all types of cruise traveller. The 64-guest Sea Cloud made her debut in 1931 and was widely regarded as the most magnificent sailing yacht in the world. Many features of the legendary windjammer are preserved in the luxurious style of the 1930's, creating a unique and impressive backdrop for any voyage. The 94-guest Sea Cloud II combines the atmosphere of her sister ship with the very latest in modern comfort. Onboard both ships, guests enjoy the highest standards of luxury and personalised service, combined with a relaxed, convivial ambiance. The intimate size of the yachts mean they can access idyllic anchorages that larger ships cannot reach.